Sea Buckthorn is a deciduous fruit-bearing shrub which can grow up to 10 metres high in parts of the world but usually grows to around 2 to 4 metres high in Europe. 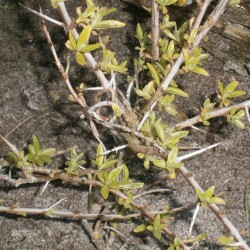 The plant has green silvery leaves which are narrow and situated alternately along the wooden thorny branches. 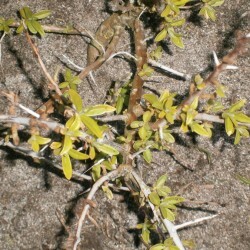 The male plant produces brownish flowers while the female plant produces orange berries. The plant depends on wind entirely for pollination. The berries are an important food source for some species of birds, including fieldfares. The plant isn’t usually bothered much by pests. However if they are, the most common pest is aphids. 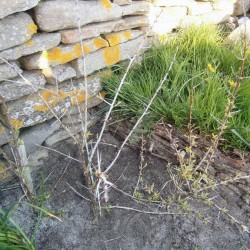 There are three main methods for growing sea buckthorn. You can sow the seeds or take cuttings. Sowing the seeds of the plant is usually quite easy and successful. But taking both softwood and hardwood cuttings is equally a success. However the plants take about 3 years to establish before they start producing berries. The plants will tolerate both acid and alkaline soils but prefer soil of pH 5.5 – 7.0. 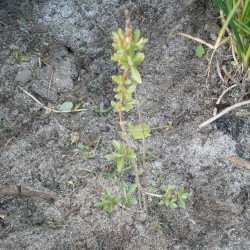 They like sandy soil the best and are commonly seen along the seashore and on steep slopes. They require an adequate amount of nutrients, especially phosphorus which is essential for producing fruit in plants. Sea Buckthorn is a useful plant as it takes nitrogen from the soil and fixes it to its roots. It acts as a good wind break and it also helps to hold the soil together. So it’s useful in helping the prevention of soil erosion along the coast and on steep hillsides where landfalls could occur. I planted about 20 plants three years ago of which about 6 have survived so far. I have found they did not grow well at all in normal earthy soil which is slightly alkaline at one location, even though I did add some sand to the soil before planting. On the other location the soil is extremely sandy. The plants at this location were more successful, of which only a few did not survive the first year. 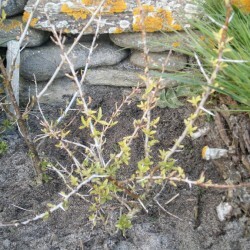 Since the time when I planted the young sea buckthorn seedlings they have slowly grown a little each year to a height of about 30cm and have produced thorns. They have yet to flower or produce any berries. But I’m still hopeful as this year is only the start of the plants’ third full growing season. Due to the thorns, harvesting the berries from the plants isn’t easy. You can wear gloves to pick the berries, but one other method is to break off the branches and place the branches in a freezer. Then once it’s frozen, the berries can just be simply knocked off. This is the easiest way of harvesting the berries. 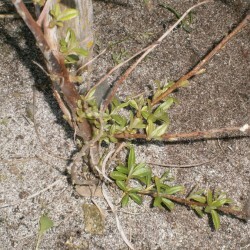 However this method is destructive for the plant. Some gardeners in Russia have a special tool they use for harvesting the berries called a wire hinge. There is also a mechanical machine which can be used to shake the plant, from which then some of the berries fall off. But even after this process, about 75% of the berries are still attached to the plant. One very useful bit of information though is that the berry clusters can be retained on the plant throughout the winter. If it’s cold enough they could maybe be shaken off more easily during freezing conditions. 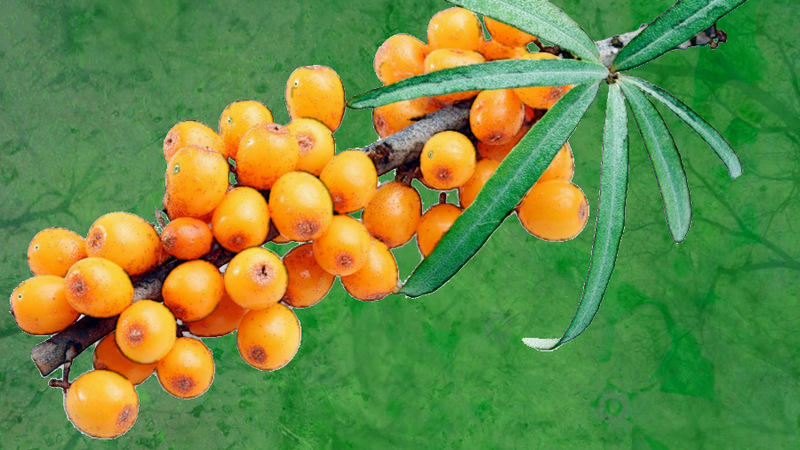 The berries of the sea buckthorn plant have many uses. They have a very high vitamin C content – by weight about 15 times more than an orange. They contain many other valuable nutrients too including Omega 3 oils, vitamin B and Vitamin E.
The berries have a very sharp taste to them and are unpleasant to eat straight from the plant raw. They are usually processed before use as they also have quite a high fat content. But they are good when added as an ingredient in baking. In food and drink the processed berries can be added to pies, juices, wine, vodka, jams, biscuits, breakfast cereals, cheesecakes and more. 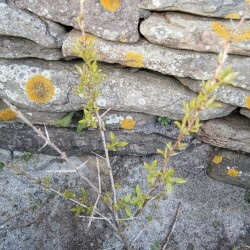 The leaves are sometimes used to make sea buckthorn tea. The oils from the berries have just as many uses. Sea Buckthorn oil is good for the skin. It’s used to make shampoo, as a skin lotion and as a sunscreen as the oils have a good protective effect against the sun. The oil is also good for treating skin conditions including psoriasis, dermatitis and eczema. During the Chernobyl disaster the oils from the plant were even used to help treat radiation burns. It’s even useful for rejuvenating the skin. The extracts of the oils from the berries have many other benefits in the treatment for medical purposes. The oils contain certain chemicals which are beneficial in treating cancer, cardiovascular problems, ulcers, sores, coughs, sore throats and bronchial problems. Also the oils act as a good natural disinfection and pain killer. It’s even used for the brain as the oils contain a neurotransmitter called serotonin which helps to regulate moods. Louis lives on North Ronaldsay. He enjoys a wide range of activities including: gardening, baking, model making and wood carving. He currently works at the Bird Observatory as well as doing a few gardening jobs for people.